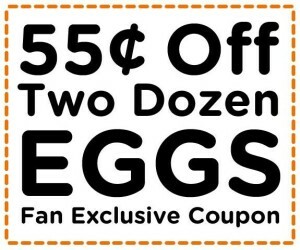 $0.55/2 Dozen Egg Coupon – Available Again! The Incredible Edible Egg $0.55/2 Dozen Eggs Facebook Fan Exclusive Coupon is back! This has reset from just the other day. If you are in need of eggs, Albertsons has eggs for $0.99/dozen with the in-ad coupon. $0.72/per dozen is a great price for eggs.